Ball valves control air and water flow by allowing you to turn a lever that slowly opens a perforated ball in a given hose line. They are known for offering great control over flow and pressure in hose lines across many industries. Typically, when the lever is at a 90-degree angle to the housing, the valve is closed, and when the lever is in line with the housing, the valve is fully open. 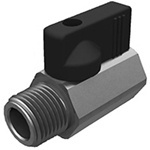 Our mini ball valves are designed for small-diameter hose systems with relatively low psi (max 235 psi). Composed of nickel-plated brass with an aluminum handle, these quarter-turn mini valves are highly durable, temperature resistant and reliable. 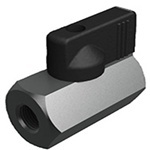 Shop for female-to-female and male-to-female mini ball valves for industrial hose today!